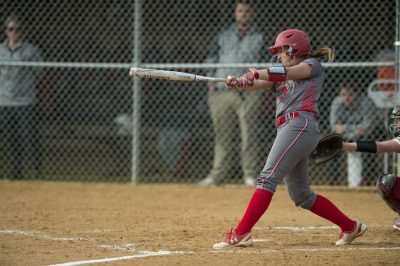 While its game one 10-1 victory was routine, game two’s 12-9 win was anything but for the Boston University softball team against Central Connecticut State University Wednesday afternoon. The Terriers (22-17, 4-2 Patriot League) jumped all over the Blue Devils (14-22) in the first inning of game one, putting three on the board. Junior infielder Madi Killebrew would single home the second run and score the third in what proved to be the beginning of a strong showing for the Dana Point, California native. Central Connecticut State would get a run in the second off of sophomore pitcher Kali Magane, but that was all she would surrender. Magane pitched a complete game, striking out a season-high seven players. Magane’s solid performance was just what BU head coach Ashley Waters was looking for as she looks toward someone to nail down the second spot in the pitching rotation. The game remained 3-1 until the Terriers got a little insurance in the fifth inning and plenty more in the sixth. Killebrew nabbed her second RBI with a sacrifice fly in the fifth before BU quelled any thought of a Blue Devils comeback. Junior center and infielder Alexa Ponce hit a laser of a home run that just cleared the left field wall before two more runners would score for the Terriers via a fielder’s choice. Killebrew then secured her first home run of the 2018 season to cap a six-run sixth inning for BU for a final tally of 10-1. Waters said she has been waiting for Killebrew to hit it out — and now that she has, Waters said she is expecting more power from her. The Terriers picked up right where they left off in the game two, as they jumped out to a 5-1 lead after the first inning. Central Connecticut State got one off of freshman pitcher Ali Dubois, but BU, and Killebrew in particular, would respond. After not hitting a homer all season, Killebrew left the yard with a three-run home run off Blue Devil starting junior pitcher Alex Casañas. After five innings, the Terriers were comfortably ahead by 8-3. However, BU found itself in trouble in the sixth when its relievers could not get the ball over the plate. Dubois was removed for freshman Cali Dolfi, who walked the only two batters she faced. In came sophomore Lizzie Annerino, who would get two outs, but then would walk consecutive batters and forced home one run. Dubois re-entered the game to try and limit the damage, but gave up a base hit to junior infielder Kaitlin Paterson. With the bases loaded, senior outfielder Emma Wong misplayed the ball and allowed Patterson, along with the three baserunners, to score and give Central Connecticut State a 9-8 lead. The Terriers responded in their half of the sixth with senior infielder and outfielder Jilee Schanda hitting a home run to tie the game at nine. Waters said she is excited for what is in store for Schanda, who tends to heat up this time of year. BU loaded the bases in the bottom of the eight with no outs and looked in position to win the game. Schanda had a chance to win the game, but was unfortunate to line in a double play. With two outs, senior infielder Kaitlin Sahlinger belted a home run over the right centerfield wall to win game two 12-9. For Sahlinger, who had a difficult afternoon, Waters asked her if she wanted the last at-bat and was met with a definite yes.